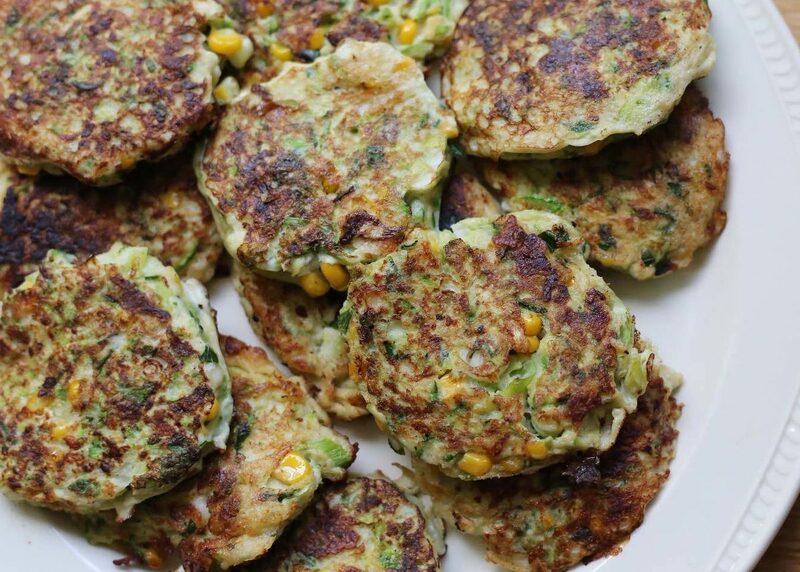 Thanks Zucchini, you make great summer fritters and great friends. Oh little Summer fritters, how we love you. You’ll always get gold stars for adaptability, sheer tastiness, and for the way you can transform the zucchinis left so eagerly on the doorstep. As usual, alter these as you wish, fritters are very forgiving which is why they’re so helpful. Essentially you’re aiming for a zucchini-based batter that’s not too runny and uses up what you have on hand. Max out the zucchini and omit the corn, try feta or leave out the cheese all together. Load the batter up with herbs and once cooked douse generously with extras like salsa, avocado, hummus, yoghurt or a soft boiled egg. Grate the zucchini and squeeze out as much water as you can with your hands. If you have large zucchinis to use, sprinkling a little salt will help. In a large bowl, combine all the ingredients, season with pepper (and salt, if you haven’t salted the zucchini already) and mix well. Heat a frypan and warm up the oil to a medium high heat. Dollop a heaped spoonful of the mixture into the pan, and cook for a couple of minutes on each side, until sufficiently golden. Rest on some paper to absorb the excess oil (compost the paper!) and serve while still warm with a dollop of yogurt or other tasty things on top. Share with the family next door. Love this recipe, simple and so delicious, great for summer and all year through!